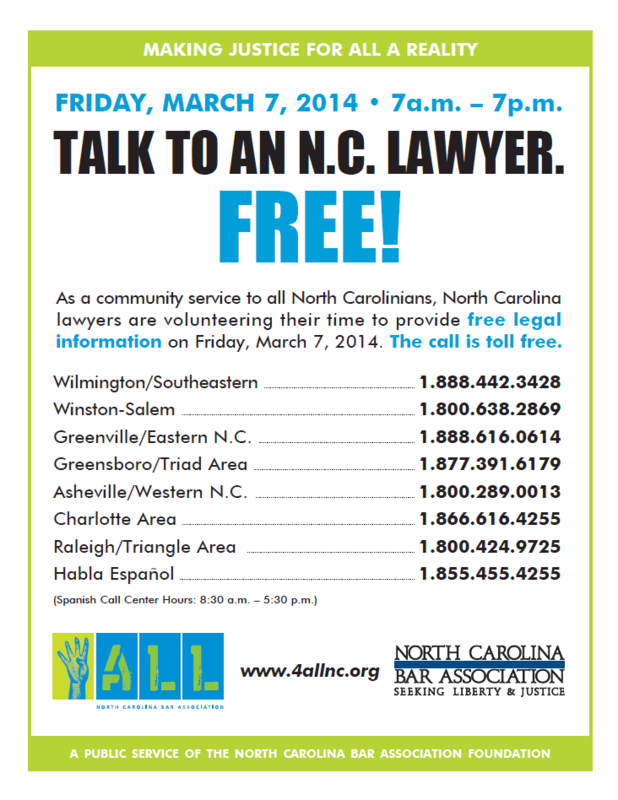 On Friday, March 7, 2014, North Carolina residents will be able to talk to an NC lawyer by phone for free during the seventh annual “Ask a Lawyer Day”. The event, sponsored by the North Carolina Bar Association runs from 7 a.m. to 7 p.m.
Statewide, there will be eight call centers filled with lawyers to answer callers’ legal questions. Locally, lawyers will be manning the phones at the Volunteer Center, and Greensboro’s WFMY News 2 will be covering the event live. Anyone with legal questions may call the local call center by dialing 877.391.6179. A call center for Spanish speakers is available at 855.455.4255 between 8:30 a.m. and 5:30 p.m. All calls are free and confidential, so callers will not be asked for their name or contact information. This statewide “Ask a Lawyer Day” is part of the NCBA’s 4ALL campaign to raise support for Legal Aid of North Carolina. Hundreds of lawyer volunteers gather annually to provide free legal information to thousands of North Carolina residents. The event was first held in 2008 during the term of NCBA President Janet Ward Black, of the Greensboro law firm Ward Black Law, and has since taken on a life of its own. During last year’s event, lawyers answered questions for almost 10,000 callers. This year, Ward Black Law attorney Afi Johnson-Parris is the statewide co-chair of the event. “We hope people all across North Carolina will take advantage of this opportunity to speak to a North Carolina lawyer at no charge,” said Johnson-Parris. For more information about the entire “4ALL” program, access this link on the North Carolina Bar Association website.